The Villa Romana del Casale is a Late Roman Villa (or Palace), dating from the late 3rd and early 4th century AD. What makes it unique among other surviving Roman villas are its floors, that are covered almost completely with well preserved (and coloured) mosaics. There are over 50 rooms full of them, in total ca. 3500 m². The villa was brought to its splendour by tetrarch Marcus Aurelius Maximianius. 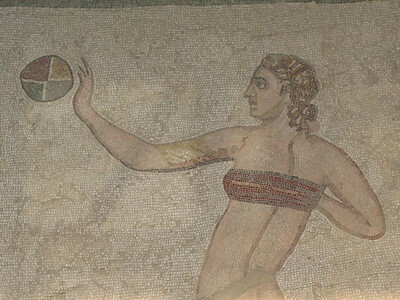 The mosaics probably were the work of North African craftsmen. The site was excavated mostly in the 1950s. This Roman Villa lies near Piazza Armerina, in Central Sicily. It's a fine location for a countryside villa. I was expecting crowds, but was lucky enough to be able to slowly do the rounds almost on my own. 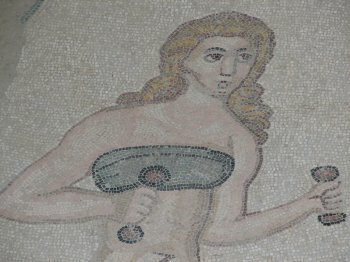 The villa is really large, and the mosaics are everywhere. 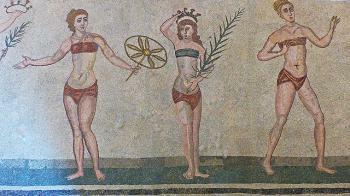 The 'Bikini Girls' - women athletes - are a set of ten mosaics in two rows in very good condition. The girls are performing exercises, from weightlifting to a ball game. One of them is about to be awarded the palm of victory. 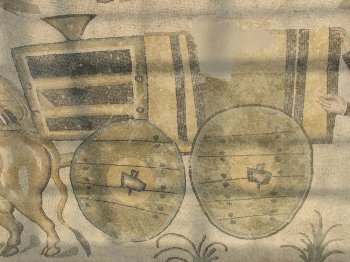 Other highlights include the Corridor of the Great Hunt, a long passageway covered with an elaborate hunting scene, and the Triclinium where mythical scenes are depicted including a bloody Battle of the Giants. As mentioned in the ICOMOS report and various guidebooks, the mosaics are shielded under plexi glass covers. This has the effect of a greenhouse, possibly damaging the mosaics. 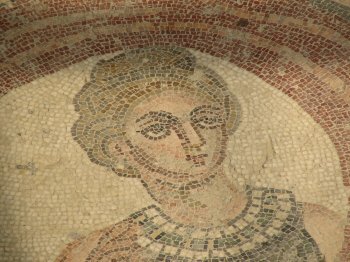 One of the side effects also is that it creates rasters of shade on the mosaics, making it difficult to get sharp photographs. I visited this WHS in May 2015 as a detour from Agrigento on my way to the Val di Noto baroque towns. The Sicilian countryside panoramas on the way to the site itself were already breathtaking but the quantity, the variety, the condition and the details of everyday life in Ancient Roman times depicted on the mosaics of the Villa Romana del Casale near Piazza Armerina were mindboggling. The only place that sprung to mind while visiting this site was Aquileia as there are some similarities between some of the mosaics but this is by far the largest in the world. My favourite mosaics were the mosaic of the two fishing vessels hauling up their net fully loaded with different fish species and crustaceans and the famous mosaic of the female athletes nicknamed the bikini girls. The female athletes perform sports including weight-lifting, discus throwing, running and ball-games. Not far from the Villa Romana del Casale is another Roman Villa called Villa Romana del Tellaro which is worth visiting while you're in the area. The Villa del Casale is now fully opened and can be visited. I visited it yesterday and I had the place mostly to myself except for a few people scattered here and there. The site now provides a very good idea as to its vastness and the importance of its Master. The visitor can have a glimpse of what it must have been in its full splendor when it served as a sort of buen retiro or as a status symbol for its owner. The decorations which cover most of the 3500 square meter of marble or 37674 ft² provide a very vivid picture of what life in 4th AD Sicily might have been for the privileged few who lived there and the people who were serving under the Villa's Master, who seemed to also enjoy entertain his important guests there. The location is very evocative also as it pertaing its surroundings, the lush nature, and the gentle landscape. What's stunning is the clearly perceived richness of its rooms, the sauna, the calidarium and frigidarium, the side rooms, the vast halls, the corridors covered in vividly colored mosaics relaying the stories of the ancient gods: Hercules, Odysseus, Poliphemus, not to mention the many men, women, children decorating the floor in hundreds of scenes. The site is now fully accessible, and it costs 10 euros to visit it. The restoration work very efficiently delivers the idea of how stunning this place once was, and still is. Well worth the visit. I visited the site in September 2012. All of the villa now accessible after the removal of the awful plastic glass structure which caused so much damage and has been replaced with wood and copper roof open on all sides to allow air flow around and through the site Damage caused to the mosaics has and still is being replaced using the original methods. Well worth the visit, I do not know about entry costs as over 65 get entry free. More archaeological digs are planned for the future as apparently there might well be more undiscovered building in the village close by the Villa. I really love the art there. However, it's really a pity that we could only visit 3 rooms, while you have to pay still 5 euro per person(Fortunately, the Bikini girls is included). According to the people there, they need 2 more years to finish all of the rebuild. Thus, if you have more time, i would strongly recommend to go there later. very disappointing that so little of the site is currently open.They only seem to be working on one building at present yet have ripped out the walkways and closed most of the site much earlier than necessary.With a little planning they could easily work in stages and keep most of the site open.What you can see is fantastic but its very frustrating to see tantalizing distant glimpses of so much more in the closed areas.I will return one day when its fully open but unless they get their act together I suspect this may be years away. June 2010 Unfortunately, we learned the villa is closed, except for 3 rooms which may be viewed afternoon times only. It's too bad the timing didn't make it possible to visit. The web site looks terrific !!! Just spent the day studying the mosaics. The site was not crowded and we had a rare opportunity to spend as much time as we liked looking at them. The mosaics are truly splendid and worth the trip to see. The site of the Villa Casale is amazing. No one seems sure of who it was built for but it had to be someone of great importance. The date is possibly the 3rd-4th centuries AD. The site is covered by a greenhouse of acrylic panels. There are many, many rooms with completely intact floor mosaics in situ. I have never seen anything like it elsewhere, especially at this scale. This is a wonderful trip from anywhere on the island of Sicilia. In the summer it is usually very hot, especially with the sun beating down on the protective roofs that cover the mosaic floors. The entire site is worth a half-day visit, especially the room of the dodieci fatiche d'Ercole (the 12 labors of Hercules) and the long main corridor that shows the many daily chores (hunting, fishing, etc) that were performed daily. Excavations continue through today, with only 1/3 of the site being excavated thusfar. The craftsmanship of the slaves (presumably from nearby Africa) in this Villa is not to be missed.